I can't believe we waited so long in our month of #undeadOctober for this one. It has been driving me nuts to wait for this one because it is one of my favorites. The reason I like this one so much is because it was one of the first zombie movies that I remember seeing, where the zombies were not dead. Until I watched this one, I was still thinking that all zombies were just silly or goofy stories about people rising from their graves. And to tell you the truth, that never did make any sense to me. If you have ever been buried in dirt or sand then you will know that it is crazy hard to move once soil is locked around you. So it never really made sense that someone who was already dead could break out of their coffin then somehow claw their way to the surface. And then this movie came along. Where a single drop of blood was the difference between a survivor and someone who was infected with the Rage virus. In addition, they were not immortal undead creatures climbing out of graves, they were just normal people. One of the best things about rage zombies is that they don't live forever either. They are more or less human in terms of lifespan, strengths, and weaknesses. The human aspect of these zombies is what makes them more plausible and makes them feel closer to truth somehow. For me, this movie is a 5/5, which is not a rating I give out very often. It had comedy (the awesome giraffe joke), love, drama, action, and to finish it all off, a happy ending. There isn't much more I could want in a movie, let alone a zombie movie. There just isn't anything bad I can say about this one and it is one that every zombie fan should see. So instead of spoiling any more of the story, I am going to the zombie summary now. 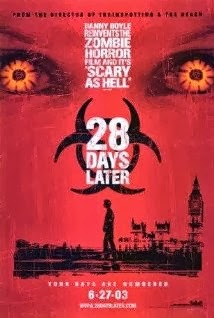 We are probably going to watch the sequel to this one tomorrow so check back for more zombie movie reviews!